A holdover tenant is a renter who remains in a property after the expiration of their lease. A holdover tenant situation arises when a tenant stays without the landlord’s consent. The only difference between a holdover tenant and trespasser is that the tenant entered the rental property legally. However, be cautious, if you continue to collect the rent from a holdover tenant without creating a new lease, the tenant will generally be considered to have a month-to-month rental agreement. In a situation like this, both the tenant and the landlord can terminate the lease agreement with one month’s notice. With this in mind, we offer some insight on dealing with a holdover tenant. Please Note: this information is not intended to be exhaustive or a substitute for qualified legal advice. You are responsible for performing your own research and complying with all laws applicable to your unique situation. Typically landlords have two options, one let the tenant stay, and two seek eviction. However, a landlord who continues to accept monthly rent and allows the tenant to stay cannot later seek eviction. On the other hand, you can choose to treat the holdover tenant as a trespasser. To do this, you must initially, and at all times, treat the tenant as a wrongful possessor of the property. And, to remove a holdover tenant from the rental property, you must then go through the eviction process. 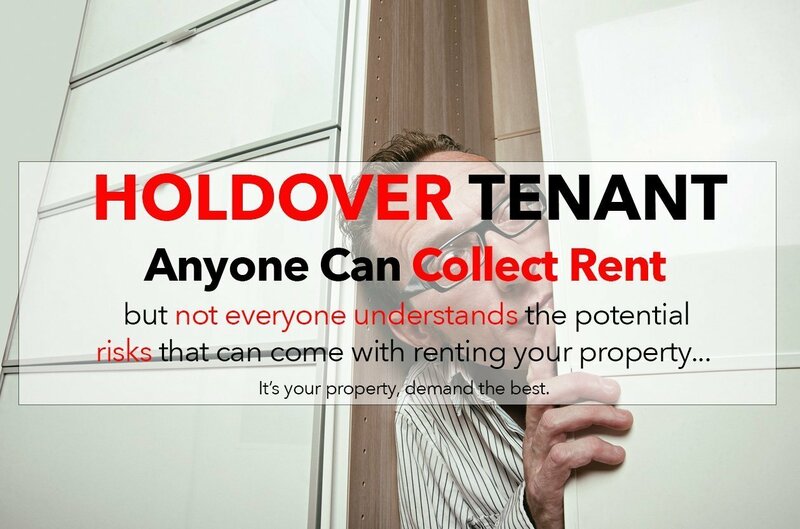 A holdover tenant is a renter who remains in a property after the expiration of their lease. A holdover tenant situation arises when a tenant stays without the landlord’s consent. The only difference between a holdover tenant and trespasser is that the tenant entered the rental property legally. The best way to avoid an agreeing to a holdover term is by refusing to accept any rent payments after the lease has expired. For example, if the lease agreement ends at the end of December, you should not accept a rent payment for January. So, unless you have decided to sign a new lease, accepting rent is a signal that you have agreed to covert the tenancy into a month-to-month agreement. To remove a holdover tenant from your rental property, you must go through the eviction process. To evict a holdover tenant, you must treat the tenant as a trespasser. This means someone who does not have permission to be on your rental property and who is acting wrongfully by staying on the property from the moment the lease ends. The best way to deal with a trespasser will be highly dependent on the laws in your state and city. For anyone who is uncertain about how to manage tenants effectively, you can solve that problem by hiring a property management company. Whether you are interested in changing property managers, or simply looking to hire a property management company for the first time, Rancho Mesa Properties can help. We take care of all types of residential rental properties including homes, condos, multiplexes such as duplex and triplexes, and even small apartment buildings. Let us manage your rental properties, so you can enjoy your life! Call us today at (858) 576-2176. We will save you time, money, and the stress that comes along with managing your own rentals.